Due to the need of the Winegrowers to reduce labour costs, the new mechanical process and the new technology in the Vineyard are going to be used over and over again. Our accessories for Vineyards, if used in the correct way, allow to work better the own vineyard speeding up the complete frame work of the vineyard. For an execellent Wire tensioning, try to use our Tensioning Device and its Hook Block-Locker. 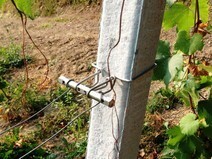 This device helps to re-tension both the main wire and the double wires which contain the vegetation. Our Wire Tensioner Collars are made in Stainless Steel Wire Aisi 302 Bright. Mollifico Effemme srl is able to manufacture this particular accessories following the demand and the need of the winegrowers. At the bottom, the models have been made thanks to our experience in this Sector which is strictly linked to the Winegrower's demand. We are able to pack your goods following your requests. INSTALLATION - WHATCH THE VIDEO! The mounting operation is very easy! 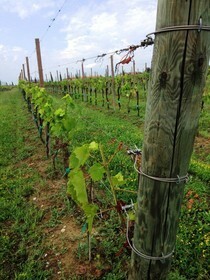 As you can see in the following video the Installation is pretty quick on every Vineyard End Post! Our wire Tensioner Collar is made in Stainless Steel Wire and it can be mounted in 2 minutes. Just open the wings of the Metal post, set it up, close the wings and insert the tensioning device. Next, insert the wire inside the two roller holes and pick up the Vineyard Wire which comes from the row simply turning around the roller on itself. Check the Tension of the Wire as you wish and lock the roller with its lock-roller. "That's it! 2 minutes, Everything is done"
Wire Tensioner Collar for Concrete Post. Used to pick up the wire throught the special Tensioning Device and its' auto-locking device. Wire tensioner collar to be applied to the Concrete Vineyard Post to facilitate the Wire Tensioning. Wire Diameter: 4,00 mm / Boxes: from 100 pieces plus Roller and Hook Block Roller. Wire Tensioner Collar for Wooden Post of any measure. Wire tensioner collar to be applied to the Wooden Post to facilitate the Wire Tensioning. Boxes: from 100 pieces plus Roller and Hook Block Roller . Reinforced Collar for Concrete Post. Complete of Tensioning Device and its' auto-locking device. together with the Reinforced Collar. Cable Tie for Chain for Concrete Posts.